In August 2018, Apple became the first publicly traded in the US to reach $1 trillion. So what’s the story behind Apple’s incredible success? It all began in April 1976 when Steve Jobs and Steve Wozniak founded what would 40 years later become the most valuable company in the world. That same year, Jobs and Wozniak released the first ever Apple product – Apple I, an innovative desktop computer that propelled Apple into the forefront of the consumer electronics industry. In December 1980, Apple became a public company after launching an Initial Public Offering of its 4.6 million shares at $22 per share. While the IPO was a huge milestone for Apple, it also brought about some big changes within the company. The sales of the Macintosh computer, released on January 22, 1984, were disappointing, which led to a power struggle between Steve Jobs and Apple CEO John Sculley. After the board of directors sided with Sculley, Steve Jobs resigned as chairman of Apple on September 16, 1985. That same year, Jobs founded his own computer company NeXT Software, before eventually returning to Apple first as interim CEO in 1977 and then as permanent CEO in 2000. 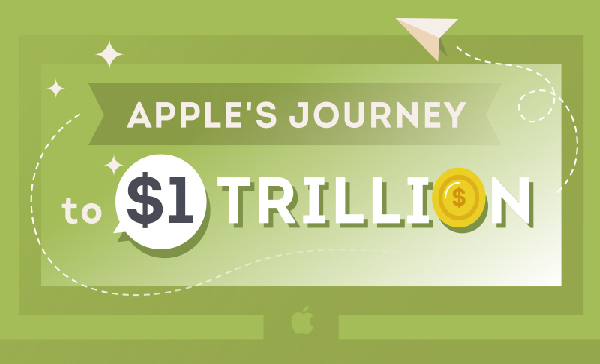 But the best years for the tech giant were still ahead, so if you want to find out more about Apple’s journey to $1 trillion, check out the infographic below by The Watchstrap.co. Love Apple devices and want a better way to manage leads & projects? Give Daylite CRM a try!